Unit 3 Part 2 – Altitude Correction tables for the Sun, Stars and Planets. 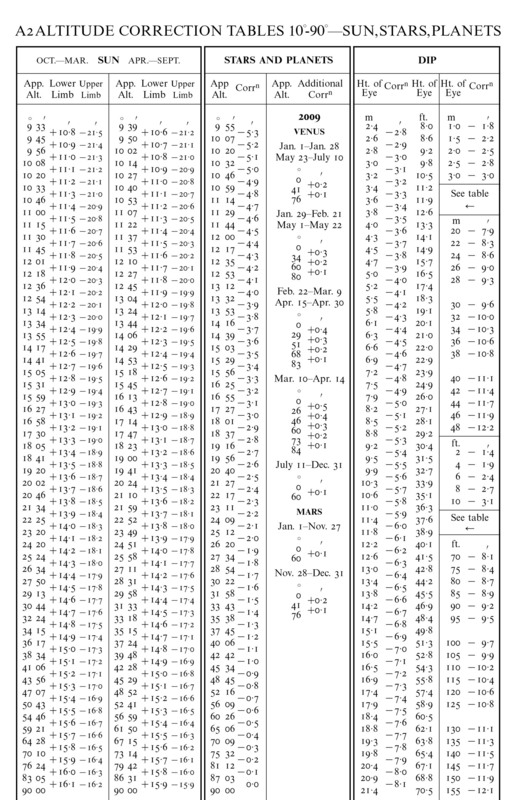 As shown in the table extract below, corrections for the Sun are divided into two parts to allow for changes in the Sun’s semi-diameter during the course of a year. The first part is for the period October to March and is based on a semi-diameter of 16’.15. The second part is for April to September and is based on a semi-diameter of 15’.9. Correction = +11’.1 (interpolating as necessary). On 12 Feb. a reading of the Sun’s lower limb was taken. Sextant altitude = 14o 35’.5. Index error = -2’.3. Height of eye = 4.2m. Temperature = 20oC. Pressure = 1020 mb. Corrections for the stars and planets are listed in only one column since semi-diameter corrections are not necessary. However, a column of additional corrections for Venus and Mars is provided for use when extreme accuracy is required. Corrections for Altitude of a Star: Using the following data and the extracts from table A2 and table A4 on the preceding pages, calculate the true altitude of a star. Data: Sextant altitude = 12o 20’.4 I.E = +1’.8 Ht. of eye = 4.8m. Temperature = -20oC. Pressure = 1010 mb. (Remember, the correction for a star consists of index error, dip and refraction only since parallax and semi-diameter are negligible). Altitude Correction Tables for the Planets. As in the case of the stars, because they are so far from the Earth, parallax and semi-diameter arguments for the planets are negligible and so the only corrections necessary are for dip and refraction. For normal navigational practices, the navigational planets are treated as stars and the correction table for stars is used. For the very rare cases that they are needed for extreme accuracy, additional corrections for phase and parallax for Venus and parallax for Mars are given in the Nautical Almanac. Example: Corrections for Altitude of a Planet. Using the following data and the extracts from table A2 table A4 on the preceding pages, calculate the true altitude of a planet. Sextant altitude = 10o 38’.6 I.E. = +2’.4 Ht. of eye = 13.0 ft. Temperature = 10oC. Pressure = 1000 mb. 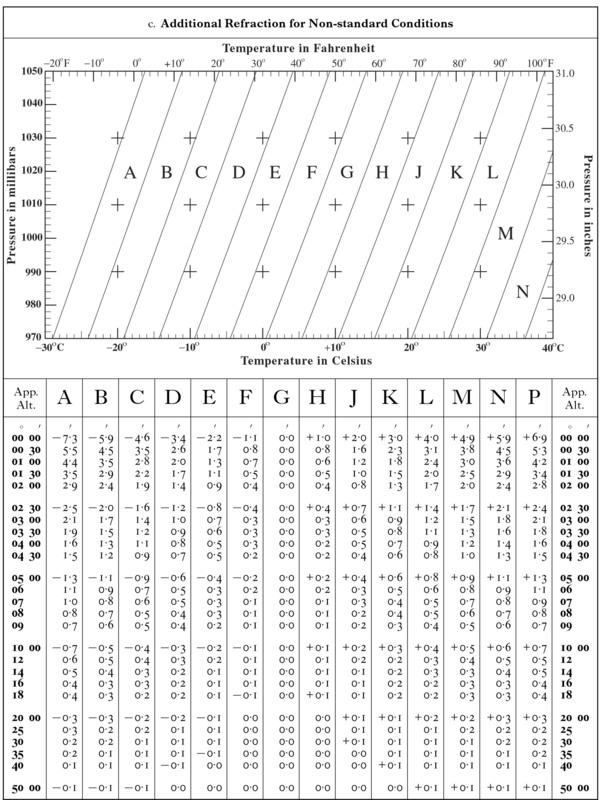 The graph above the table is entered with the temperature and pressure to find a zone letter. For example, entering with a temperature of 20oC. and a pressure of 1010mb. gives zone letter J. The table is then entered with the apparent altitude and zone letter to find the additional correction for refraction. Example. If apparent altitude = 4o 30’, temperature = 30 oC, pressure = 1000mb, the zone letter will be L and the correction will be +0’.8. On 12 June, a reading of the Sun’s lower limb was taken. Sextant altitude: 50o 45’.2. Index error: +1’.8. Height of eye: 24 ft.
What was the true altitude? Sextant altitude of Sirius: 18o 08.’5. Index error: +2’.1; Ht. of eye: 12m. What is the true altitude? Sextant altitude of Venus: 17o 43’.3. Index error: -1’.4. Ht. of eye: 15 ft.
Altitude correction tables for the Moon will be explained in Unit 3 Part 3. This entry was posted in astro navigation, astronomy, celestial navigation and tagged astro navigation, astro navigation course, astronomy, celestial navigation, celestial navigation training. Bookmark the permalink.